Sunnyvale, CA – November 19, 1981 – Axlon Incorporated of Sunnyvale, today announced the release of its portable personal communication terminal for the home and business market. 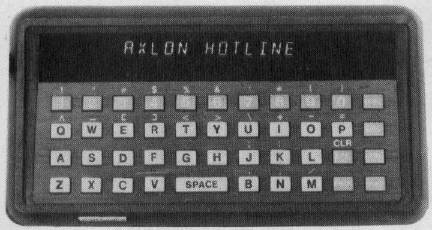 Called the Axlon HOTLINE™ Personal Communication Terminal, it can be used to transmit and retrieve information from data bases as varied as a personal telephone directory to the New York Stock Exchange. The Axlon HOTLINE Personal Communication Terminal measures 1&frac58;&inch; × 3&frac916;&inch; × 6¾&inch; and weighs less than 11 ounces providing a truly portable means to communicate with host computer systems. The terminal combines state-of-the-art features such as a built-in modem with more familiar features including an alphanumeric keyboard. The tactile keyboard consists of 43 functional keys arranged in typewriter sequence and provides a 64 upper case ASCII character set. The display is a 16 character fluorescent display which is tilted for viewing. The terminal offers a 96 character display memory, which can be scrolled 16 characters at a time, and a 16 character display memory in the transmit mode. The Axlon HOTLINE Personal Communication Terminal is designed for ease of use. The user dials the data base, waits for the connect signal, and then connects the modular headset jack to the terminal's modular telephone receptacle. The terminal also has a receptacle for connection of an ASCII serial printer should the user require hard copy of information retrieved. For more information contact John Vurich or Robert Sultemeier, Axlon, Inc., 170 N. Wolfe Rd., Sunnyvale, CA 94086.